Yes, Kallis needs to open and set himself up to play 10 overs. At least Gambhir is getting back into form here. Will make a big difference down the road. Kallis' wicket was coming. I doubt he'll replicate his innings in the first game again. ^ If only Yusuf could provide us with that firepower at least once in 3 games. Pandey out. Third low score in a row. Hope this Tambe guy gets smashed in his next over. Trust KKR to make the chase difficult. They finally give Surya the promotion he so deserves. Not over yet, KKR have lost from here before. They should look to finish this in the 19th over itself - Faulker probably. Gambhir, Surya and Pandey to bat. Narine to bowl. Scores tied... it's a SuperOver! HUGE test for Sunil Narine this. Well, big test for any bowler. But there is just too much expectation from Narine. Get Watson first ball and we get bowl them out in 3 balls. Mind it, if it's a tie i.e RR score 11 then RR will win based on number of boundaries scored by each team. Don't they count the number of 6s first and then the number of 4s ? OR do they count the number of total boundaries first and then the number of 6s, 4s ? what was Gambhir thinking ? Why weren't the fielders in the circle ? Tie and RR win. Oh man. Probably did not know the rules. He might have thought sixes too just like you and I did. Should have won it, thought they had it in the bag going into the 18th over but you can never be sure with KKR. Regardless of whether they won or not, they really need to score quicker at the start so there's less pressure towards the end. Going along at 6 an over or under for 11-12 overs or so isn't good enough. Seriously, did any of you see SRK in the broadcast? I need to know whether to go through my DVR recording frame by frame or not. Help me out here! Actually I was surprised when I saw the pics and he was there !!!!!!!!!!!!!!! I watched the whole match, they didn't show any glimpse of him ?????????? OK, thanks guys. I'll hang on to it a couple of days, just in case. Didn't he tweet about being on the plane and how nice everyone was? He wasn't there. There is NO WAY he was there and not pictured. 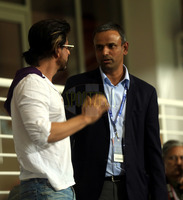 Maybe these seemingly new pic (because of the bandage) of from the game in between in which KKR didn't play. Is that possible? Painfull loss this one. Probably should have won. But I guess you win some you lose some. WE really shouldn't have won against RCB but did, so guess this settles that. however, once again cricket rules are sooo stupid. Gosh, it's so sad for any team to lose like that. Honestly, I don't even know why we need a super over in the league stage, it should only be in knockout games. When both teams play so closely, they really both deserve a point each. And then to tie even the super over, c'mon at least then give both teams points. That's what most sporsts do eg you only have penalty shoot out in finals for football, hockey. Not every freaking game.